September 28, 2008- AFA in South Manheim Twp. September 28, 2008- At 07:20 Liberty Station 4 was dispatched to assist Districts 47 (Landingville) and 56 (Orwigsburg) on an Automatic Fire Alarm at 1517 Schuylkill Mountain Road, South Manheim Twp. First on scene chief arrived and was told that it was a false activation and that there was no need for fire, and he cancelled all units prior to arrival. September 28, 2008- At 00:030 Duty Chief 723 (Donatti) was dispatched to 17 St. Peter Street, Schuylkill Haven Boro, for an unknown type alarm. Chief Donatti arrived on scene and had asked to have Station 1 dispatched for Ladder 725 to assist at the scene in finding the cause for the alarm. September 23, 2008- Just before 3pm Stations 1 & 4 were dispatched to assist Districts 47, 56, and 42 at 1001 Orwigsburg Manor Road, Orwigsburg for an Automatic Fire Alarm. However, before any Schuylkill Haven units could arrive on scene they were placed available by incident command, stating a false activation. September 23, 2008- Another Day, Another Worker in…Wayne Twp. September 23, 2008- At 03:22 Liberty Station # 4 was dispatched to assist District 34 (Friedensburg, Summit Station) at 97 Red Hill Road, Wayne Twp for a working structure fire. Tanker 738 was dispatched for tanker shuttle operations and 737 for manpower. Upon arrival the cabin was fully involved so no attack was made toward the fire other than the usual "surround and drowned". Station 4 was busy, out of the boro til 08:00. 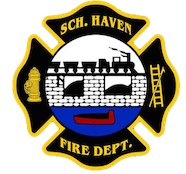 September 20, 2008- Just before 2AM the Schuylkill Haven Fire Department was dispatched on a first alarm assingment to assist District 39 (Auburn) on a Commercial Structure Fire at 2033 Market Street West Brunswick Twp. (Precisionaire Industries). First on scene chief advised County Communications Center of a Working Commercial Structure Fire and had asked to have a Tanker Task Force as well as a Ladder/Tower Task Force activated do to the overall size of the building and size of the fire. Ladder 725, Squad 726, Engine 732, Engine 737, and Tanker 738 all went responding within seconds of the initial dispatch and were put into use almost immediately after arriving on the scene. Ladder 725 was put into operation and used a master stream on the main fire building at the request of incident command. Engine 732 was used as the primary feed engine, feeding first in engines as well as 725 using "dump tanks" (aka portable dams) attacking the fire as the crew from the engine went in the northern side of the building to make an attack. Tanker 738 was used for tanker shuttles, filling up at various different spots throughout the course of the fire. Engine 737 was used as well as many other engines to lay 5 inch hose (all of it) to hook up to the hydrant system in Auburn. List of the known units on scene: Auburn, Deer Lake, Friedensburg, Summit Station, Orwigsburg, New Ringgold, Pine Grove HH&L, Landingville, Minersville (Engine 521), Pottsville (Engine 11, Rescue 63, Ladder 51), Llewellyn, Mount Carbon, West Penn Twp, Walker Twp, Pine Grove North End, Tamaqua R.I.T. Berks County companies: 50, 33, 40, 29, 30, 37, 38, 41, and 27. Through the course of the fire there were also several move up assignments coming from other Berks County companies as well as Lebanon County. September 14, 2008- Working Fire in Wayne Township Again!! September 14, 2008- At 01:51 Station 4 was dispatched to 15 Manor Road, Wayne Township for a Tanker Task Force on a working structure fire, assisting District 34 (Friedensburg and Summit Station). Tanker arrived on scene and assisted with the tanker shuttles and the crew assited with overhaul. Station 4 was busy for roughly 1.5 hours.